46 Pageviews needed. 46. Period. This morning I pedaled, the real part, another 22.1 miles on my Schwinn 170. Totals – 16,562.5 miles; 26,654.8 kilometers. And right now I have not got a clue whether or not I am on a real road in the virtual part of my journey. I turned off of Wills Developmental Road onto National Route 1. I’m not sure if the road got any better. All I know is that I am now about 13 miles from my next destination and goal point in Queensland. 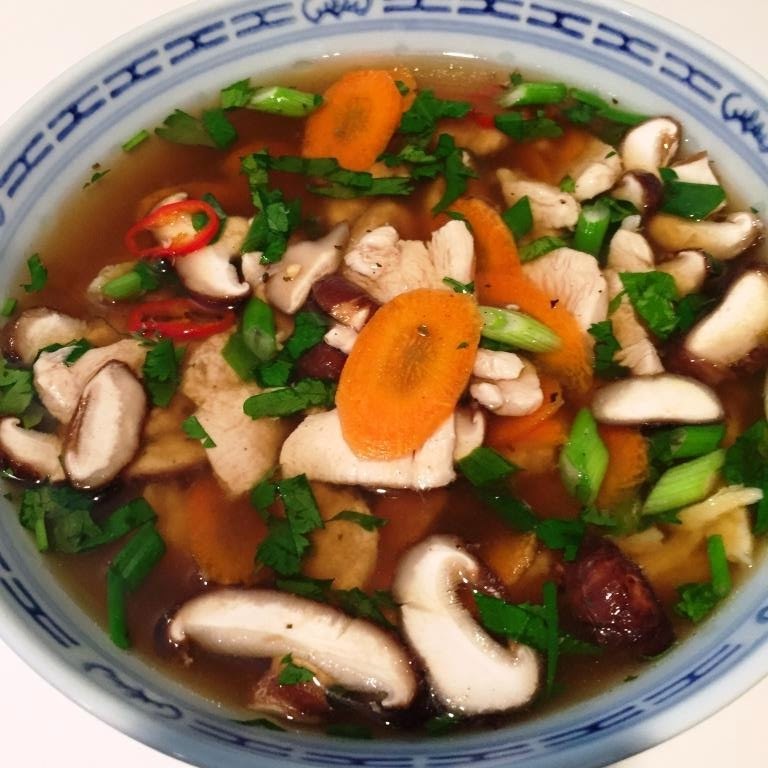 Tried to concoct my own Pho recipe for supper last night. It worked, I think. Chicken, Shitake Mushrooms, Carrots, Green Onion, plus, plus, plus. Blood sugar dropped 10 points to 101…even after I had two scoops of Ben & Jerry’s, some Chicharrónes and a Mexican Coke later that evening. Tonight I’m going to try a recipe which includes Lobster Balls. Stay tuned. Just wondering and been having a discussion with a few friends regarding the naming and the marketing of a speculative product. I stand by my opinion that if one intends to produce, and make a career with respect to a certain idea, one should consider an initial R&D process to assess one's own personal intentions. What is the mission? A “Pro/Con” listing is always a good place to start. The next criteria should be the “targeted” market. One cannot name something one name and expect it to be accepted by all marketplaces. 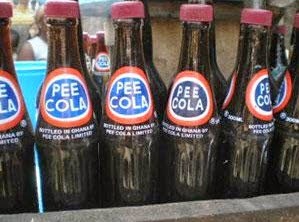 In Ghana, this extremely popular soda, translated means “very good Cola”…but I do not think I would venture a purchase. This is my 850th post. According to Blogger Jim’s Trek has recorded, as of this morning, 65,196 Pageviews. March 2014 – 2,980 versus 2,935, 2015. Back on my Schwinn 170 this morning I pedal 23.2 miles. My totals are now: 16,540.4 miles; 26,619.3 kilometers. I am headed north on the Wills Developmental Road in Queensland. I expect to be in Queensland for about another 1,830 more miles. Overall I should be completing by Australia, Jim’s Trek III on about July 30, 2015. Oh did I say I like the color of red? 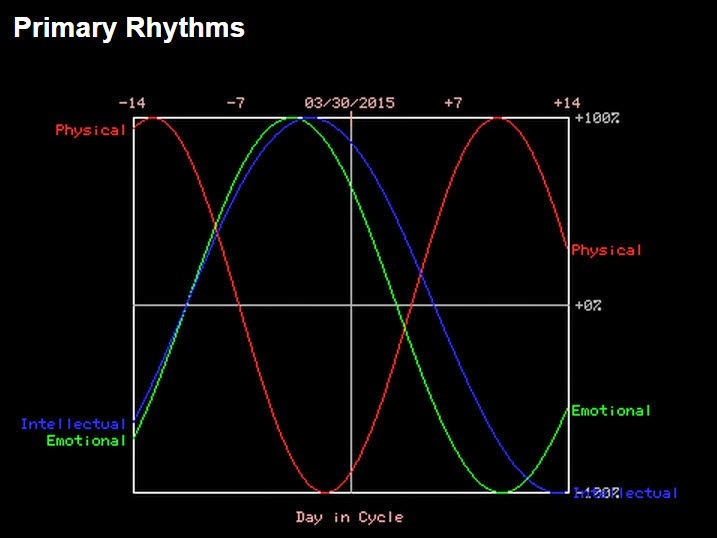 I have written about my biorhythms a number of times before. I am not an ardent follower or am I not a conspicuous believer in the cycle theory. When I took the day off yesterday from pedaling I was listening to my legs and body, sort-of. This morning I decided to take a gander at the positioning of my three cycles. Check out the above chart crossing of my Physical cycle yesterday. Enough said. 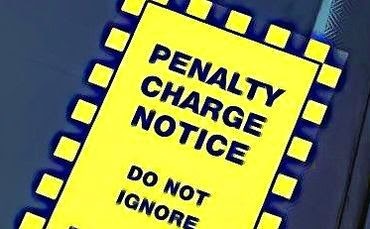 Questions - Why is it that some companies believe that customers can and should read their minds? Does not the moniker “Customer Service Representative” translate to one who chooses to become a Representative to provide a reasonable Service to a Customer? 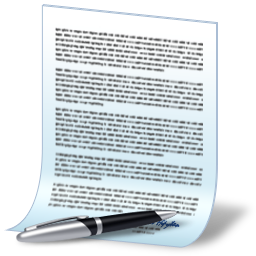 How hard is it to explain and provide a reasonable explanation to a customer why the firm needs a signature? I wonder if Barbie’s Ken Cream Wax will harden my hair follicles enough to keep it from thinning. Where was this Korean product when my widow’s peak disappeared? 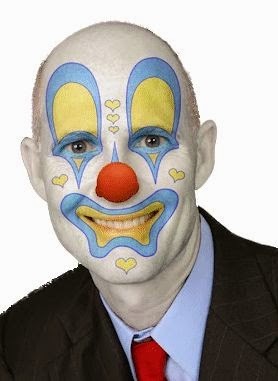 Governor “Pence fends off critics, says new law doesn’t discriminate.” And I thought there was political rubber-necking at its extreme only in Florida, Governor Scott? Oh yeah, I suppose I should include ½-time Governor Ms. Sarah Palin. This is my 849th post. According to Blogger Jim’s Trek has recorded, as of this morning, 65,102 Pageviews. Only 140 more Pageviews in 2 days to surpass March 2014; 2,980 versus 2,841. My legs seem to be telling me to take the day off from cycling on my Schwinn 170. I think that I have mentioned that it may be a wise and good move that I just allow my muscles to rest after every 14 or so days. Well today is that 15th day…and today I just take some time off. 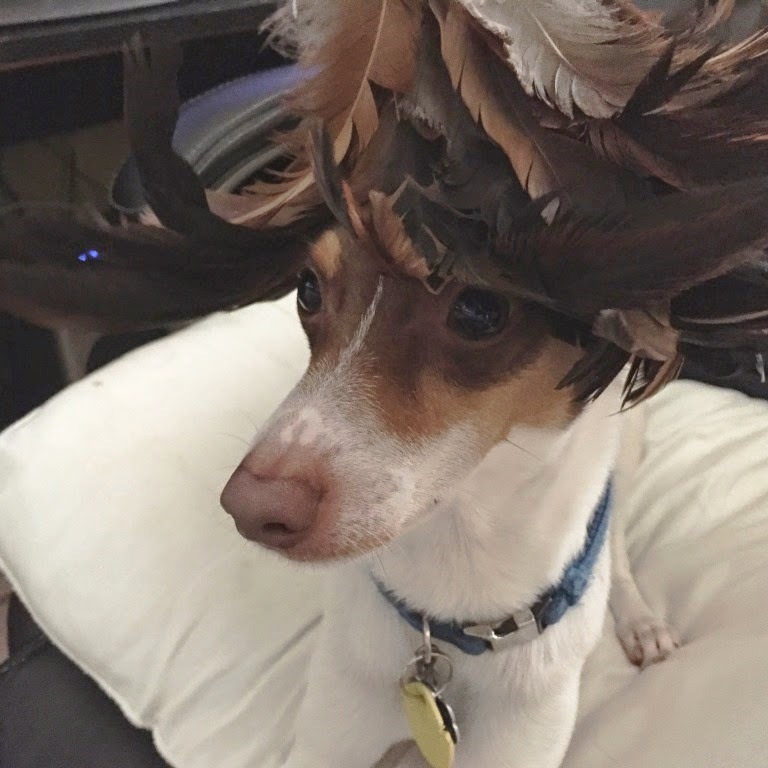 Oh and Max thinks that he needs an Easter Bonnet. 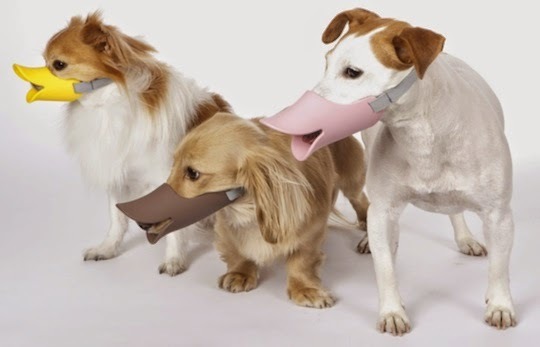 And the Pack think that they would like to dress up with their new Easter muzzles. 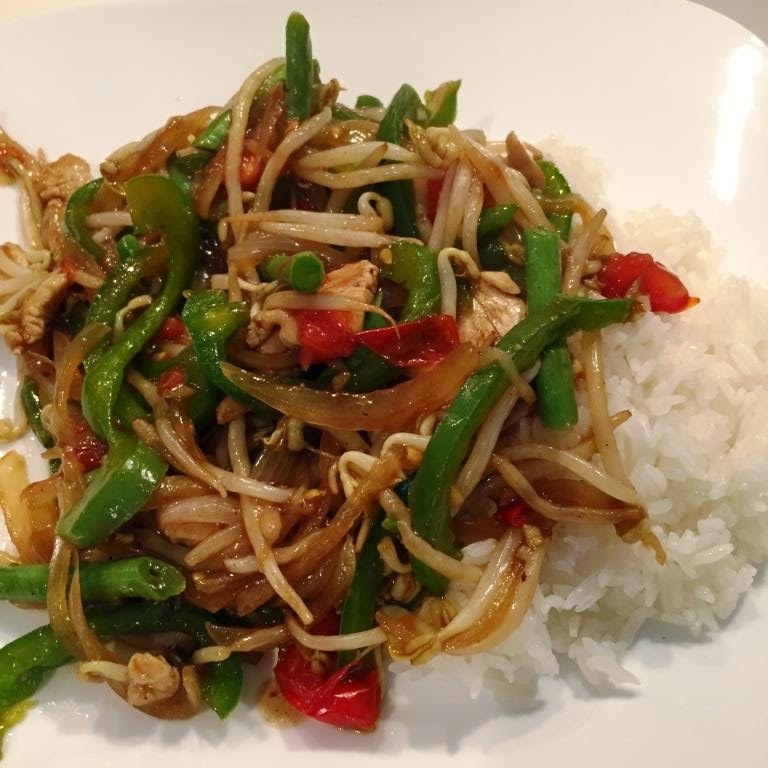 My take on Chicken Stir-Fry with Green Beans, Green Peppers, Jalapenos, Ginger, Garlic Red Chili, Onion, Bean Sprouts, Five-Spice, Chicken Broth, Corn Starch, Peanut Oil, Long Green Beans. Jasmine Rice and Coconut Oil. Early morning blood sugar 112. Hey ZC, I tried the rice and coconut oil thing. I steamed 1 ½ cups of Jasmine Rice in 1 ½ cups of water with about ¼ cup of Coconut Oil. Tasted great. And thanks. Did I say I like food? And there are times I just can’t think of something to conjure up for supper. I’m I realizing that I have that type of stress added to my life and psyche. Well I found something to just take the edge off when I am planning and thinking of what to put on my next plate. 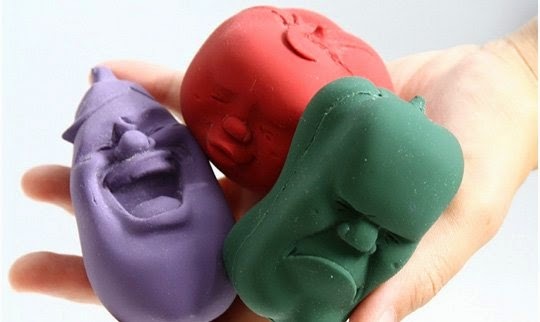 Cao Maru Vegetable Stressballs. And now I can calmly check out the many repeated copies of the same recipe on the Internet. When will politicians ever learn that they are only, to some, most degree(s), a “pretty face” with the brain capacity and consideration of their puppet masters? 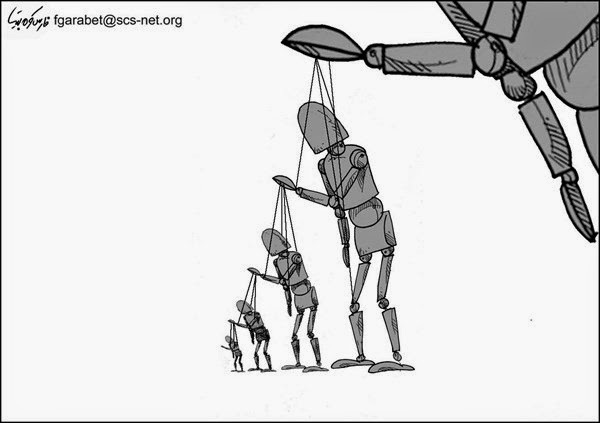 And if you do not vote, you are knotting the strings. This is my 848th post. According to Blogger Jim’s Trek has recorded, as of this morning, 65,034 Pageviews. Today I pedaled another 22.1 miles on my Schwinn 170. This is my 365th day of pedaling since I began Jim’s Trek III. I have been cycling for one year for a total of 7,900.1 miles; 12,714.0 kilometers. I also reached another highlight today; I crossed the 16,500-mile mark on the 795th day of cycling since I began December 2, 2012. My grand totals for all three of my Treks are 16,517.2 miles; 26,581.9 kilometers. I now have just less than 25% of the number of miles remaining that I set for myself on this crazy journey. 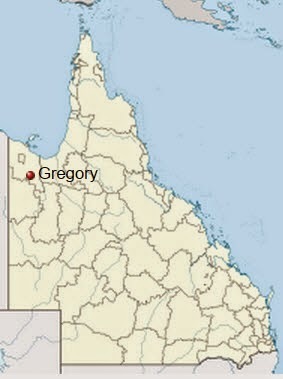 This morning, traveling north, I passed (virtually of course) through the small town of Gregory, population about 40. I am located on Wills Developmental Road. And if this road is under development, I would say that the Google image date is just a bit behind the times. It is dated May 2008. Some people should be ashamed, extremely ashamed of themselves. Isn’t it confusing that a country, this one, which became a haven for those who were escaping the bounds and the lack of religious freedom, is now using religion to persecute liberties, choice, and freedom? I wonder how well their interpretations fare? The enumeration in the Constitution of certain rights shall not by construed to deny or disparage others retained by the people. 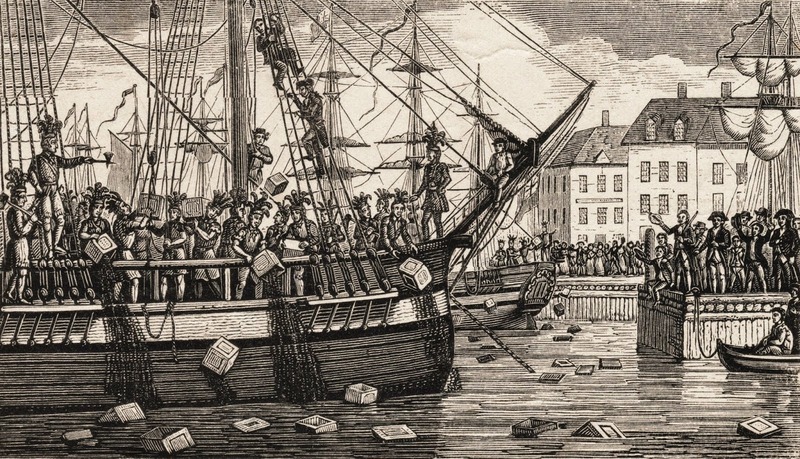 A number of “Christians” proclaim that in the United States they are “being persecuted” for and on account of their religion and beliefs. The so-called “persecution” is considered a contrary attitude and/or life-style not consistent with their current freedoms. On the following chart please tell me where one finds the United States. There are at least 195 independent countries around the world. 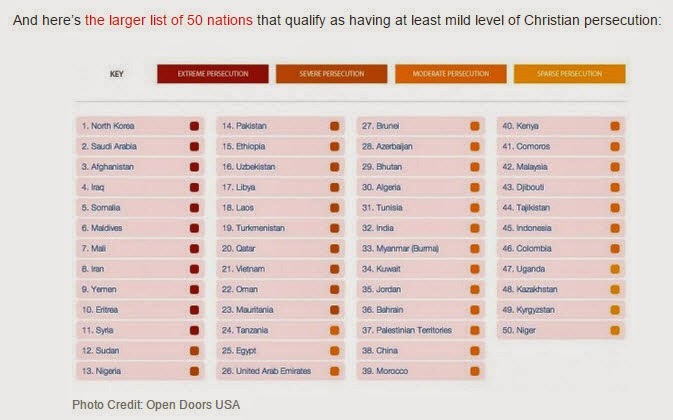 Any individual who would like to feel the throes and suffer the indignities of extreme-through-sparse persecution because of his/her faith does have a choice living in little more than 25% of the globe, considering border designations. Please do move to temper your experiences of persecution. Question – As the age-level of elected officials appears to be decreasing, I wonder if their sources of political education include the spectacles of television and movie film scripts? Just a thought. The American President, The West Wing, House of Cards, et al. This is my 847th post. According to Blogger Jim’s Trek has recorded, as of this morning, 64,961 Pageviews. Jim’s Trek needs 300 more Pageviews to supersede the total number reached a year ago. As of yesterday – 2015 = 2,700; 2014 = 2,980. Including today 4 more days to go. I pedaled 22.2 miles this morning on my Schwinn 170. My totals are 16,495.1 miles or 26,546.4 kilometers. I have now completed 75.06% of my Australian Trek and 66.24 % of my overall goal. I just keep cycling…and keep thinking that I’m crazy. Just wish that I could reduce my “elder statesman’s” gut. 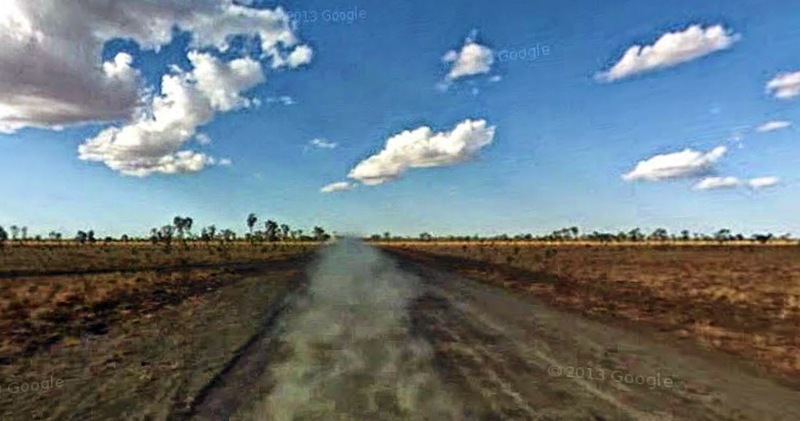 And yes I am still on the dirt road, somewhere in Queensland, Australia traveling on the Gregory Downs-Camooweal Road. 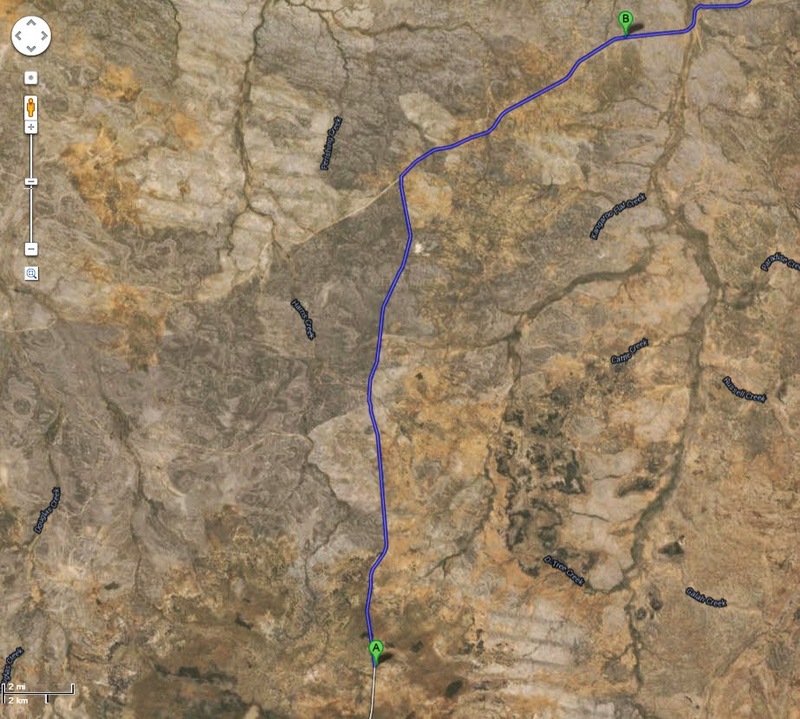 From the satellite picture I can see that I am running parallel, just about, south of the Gregory River. There are 80.4 more miles for me to go to get to my next destination and goal point. The cybercriminals are, they do not appear to be, they are increasing in numbers and frequency …and I mean I think they have targeted my land-line. 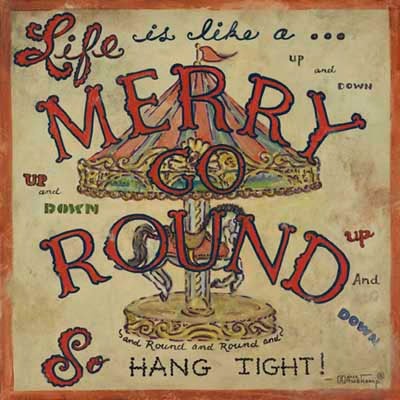 And it is always the same bloody damn shtick, “Meester Smith puleese? 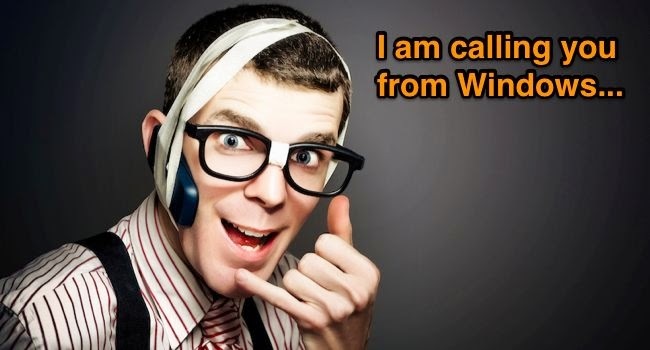 I am calling from Microsoft Service.” Microsoft DOES NOT initiate “cold calls”. I have even had one false representative rattle off a bogus reference case number. I immediately threatened to call the authorities. She, yes it was a she this time, hung up. 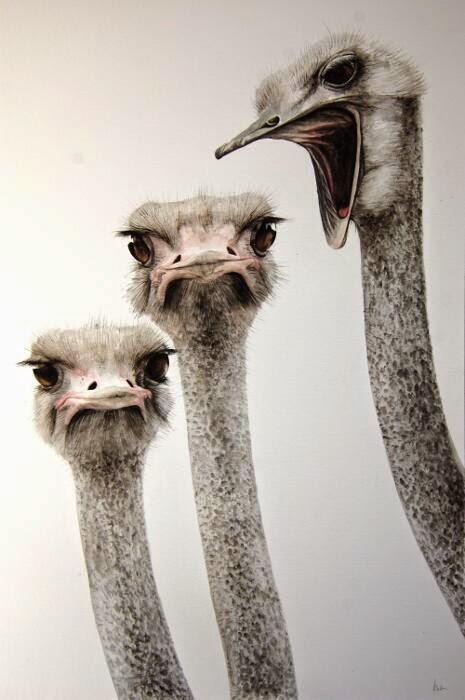 The telephone number that registered on my phone was “Unavailable 47-203-151-6369”. When I re-dialed the number I received a busy signal. The “47” is the Country Code for Norway. The remainder of the number does not appear to be a Norwegian configuration. The “203” is a code that covers the southwestern part of Connecticut. Of course when I tried to call-back, each of a number of possible combinations I received a busy signal. I submitted a Scam report immediately to Microsoft quoting the telephone number and time of day. Well my early morning blood sugar count just hit 92 mg/dL. According to WebMd “A normal sugar level is less than 100 mg/dL after not eating (fasting) for at least 8 hours.” So I made it again. And I dropped off by 37 mg/dL since yesterday. Oh and by the way unless there was something wrong with my meter I ate reasonably well up to about 10:00 pm last night. 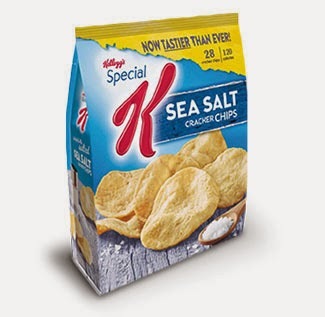 I had bowl of Conch Chowder, I had Chicken and Basmati Rice, Potato Kale Curry, a side of spicy Garbanzo Beans, an Egg-Salad sandwich, 1 ½ Jamaican Patties, two scoops of Chocolate Ice-Cream and a whole bag of Special K Cracker Chips. I certainly don’t think I starved myself. And I am still not taking any of my prescribed diabetes medications. 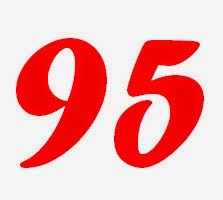 I have gone 617 days without any of the meds, since July 18, 2013. The quilting of our new Chopsticks may be done. Now the binding to be added. 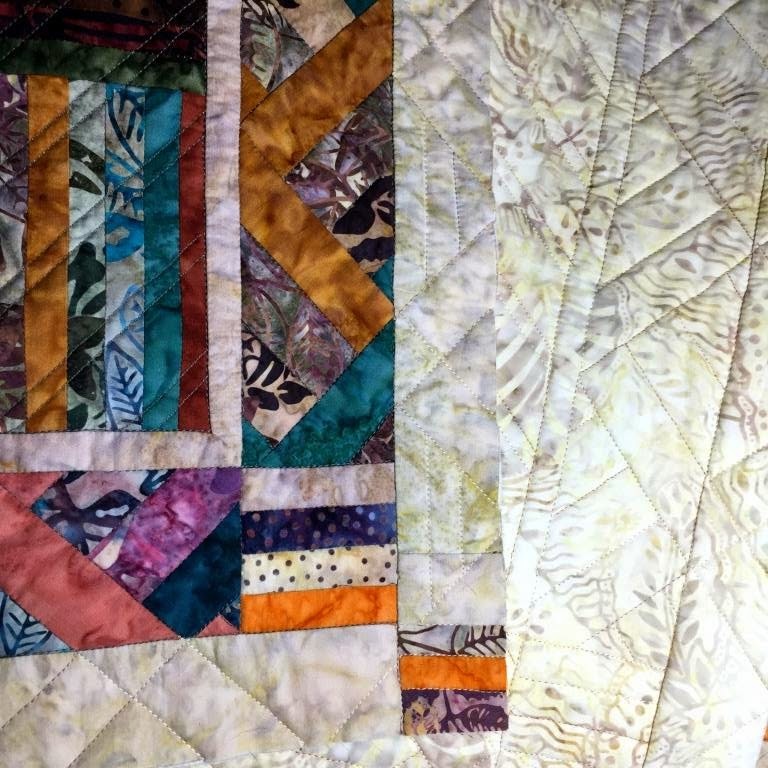 Follow updates at Quilts SB - http://quiltssb.com. This is my 846th post. According to Blogger Jim’s Trek has recorded, as of this morning, 64,893 Pageviews. All my machines have to off. Either that or it is the Cigar City's Oyster Po'Boy and glass of cider I had for supper last night. My blood sugar jumped 33 points this morning. My weight is up; as are my are my Fat % and BMI. 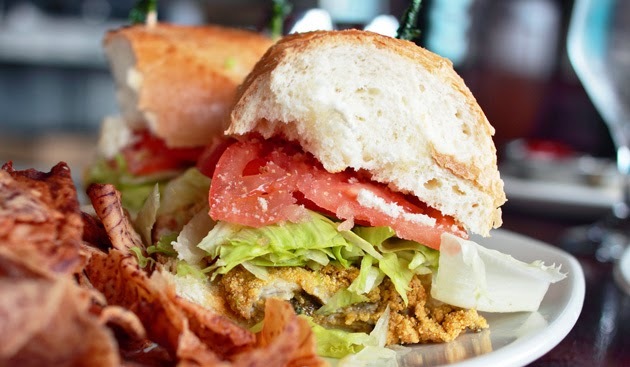 I've never eaten or attempted an Oyster Po'Boy. I only like smoked oysters and Oysters Rockefeller. The Oyster Po'Boy wasn't bad. Also I started a new inhaler, a test for my allergies. Then again I could need some new batteries. Not me, the machines. But this morning I did pedal another 22.2 miles on my Schwinn 170. And no, I am not cycling backwards on my fitness cycle. The Google Map images appear to be going in the opposite direction to where I am going. 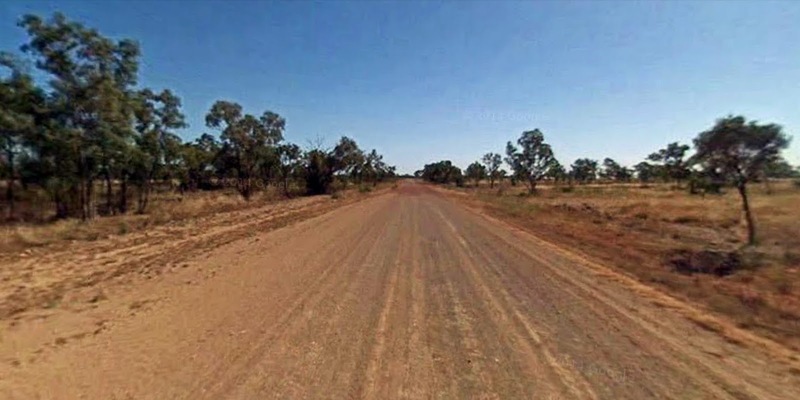 And hell the road, Gregory Downs - Camooweal Road is not paved. Just red dirt. I now have 103 miles remaining until my next destination and goal point. This is my 845th post. According to Blogger Jim’s Trek has recorded, as of this morning, 64,840 Pageviews. This morning I pedaled 22.2 miles on my Schwinn 170. That’s the real part. Totals – 16,450.7 miles; 26,474.9 kilometers. 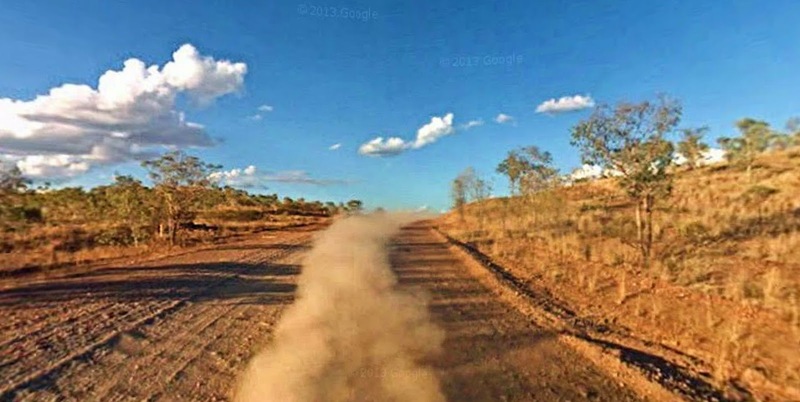 My virtual journey has me located on the dirt, and I mean dirt, road of Gregory Downs – Camooweal. I now have 125 miles remaining to reach my next destination and goal point. Today I ran an errand to one of the Publix grocery stores near my house. I was in the store minding my own business, picking out some bananas in the fruit aisle. 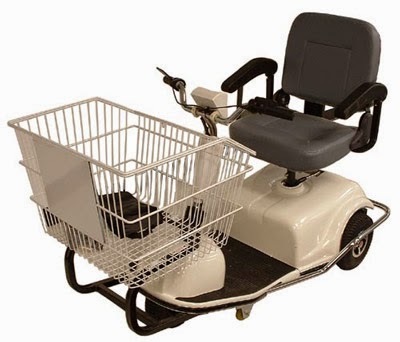 Next thing I knew was that I was being attacked by an elderly lady in a motorized grocery cart. I immediately jumped out of the way. Then crash, the errant driver smashed over a free standing display of Kiwis… not the flightless bird but the fuzzy brown fruit. Kiwis flew all over the place and rolled over the floor… Oh I’m so, sorry was the apology and off she purred down the aisle. I continued my shopping but kept my eyes open for the slow-moving Cruella Deville. 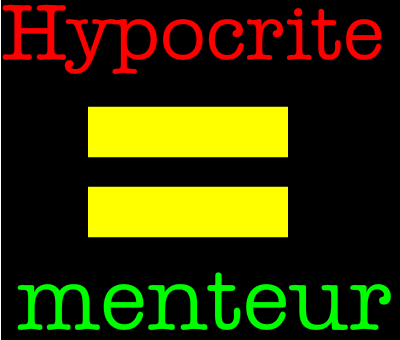 The word for today is hypocrite. Period. U.S News & World Report – Last Call: Ted Cruz Signs Up For Obamacare. Many Canadians are bilingual. This is my 844th post. According to Blogger Jim’s Trek has recorded, as of this morning, 64,793 Pageviews. Yes this morning I pedaled once again, 22.2 miles on my Schwinn 170. My totals to date - 16,428.5 miles; 26,439.2 kilometers. 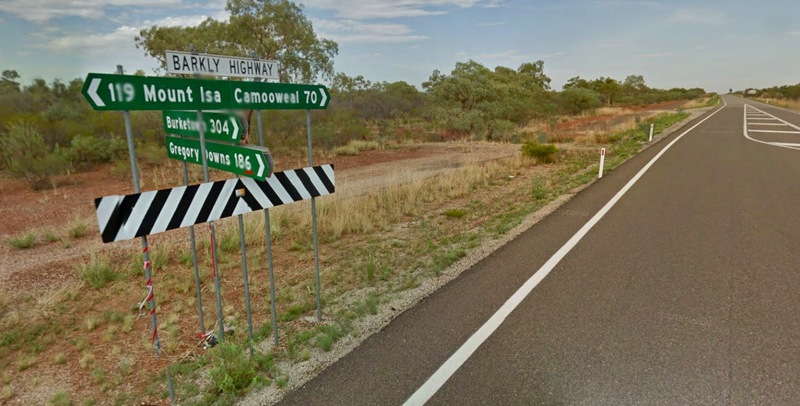 And I am now located, I think, on Gregory Downs-Camooweal Road still heading north in Queensland, Australia. Looks like the paved road is gone. Can’t see for the dust. And the political campaigns will be dust…so you better get your visors out in order to see clearly for the dirt. So 10,000 give or take, students at Liberty University are required to attend morning convocation exercises three times a week. A natural at a private ultra-and traditional evangelical Christian school; it is a part of the curriculum. chooses to attend this type of “restrictive-type” of university/college who am I to argue. But for a politician to use a “forced” attendance as a platform to spin a yarn and announce his candidacy… sounds like this 2016 Presidential campaign is going to be a “better” circus with so, so many damn rings. Just you all be prepared for the ride. I just found and read a couple of sites that discussed what is overrated and what is underrated when it comes to Sushi. Did I ever tell you I do love to eat, and have I ever mentioned that I do like Sushi? (And yes I know that the information is published on the Internet.) But this sort of makes sense, sense enough for me to try. My go-to at any Sushi restaurant is always salmon and tuna. I just love Tuna Tataki as well as Spicy Tuna Rolls. I also always get something with salmon. But according to my reading this morning salmon and tuna may be “Overrated” and “It (salmon) has become both an obligatory and nonsensical menu item.” An underrated on is mackerel. Guess what? My regular orders are going to change…I need to change. But I think I will still skip the uni. 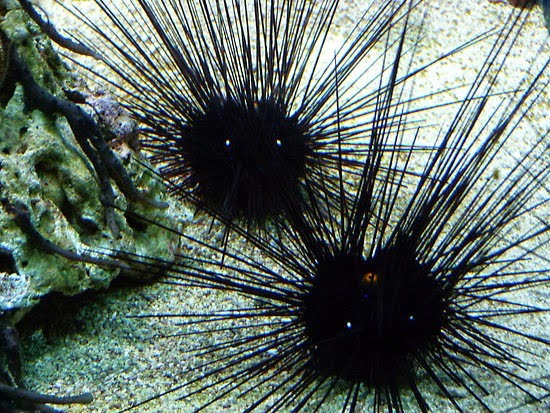 Recollected visions of a teenager me water-skiing and stepping on a black sea urchin…candle wax and a scalpel to my heel. This is my 843rd post. According to Blogger Jim’s Trek has recorded, as of this morning, 64,735 Pageviews. This morning the rainy season has arrived a couple of months early here in Tampa…and I’m not complaining. 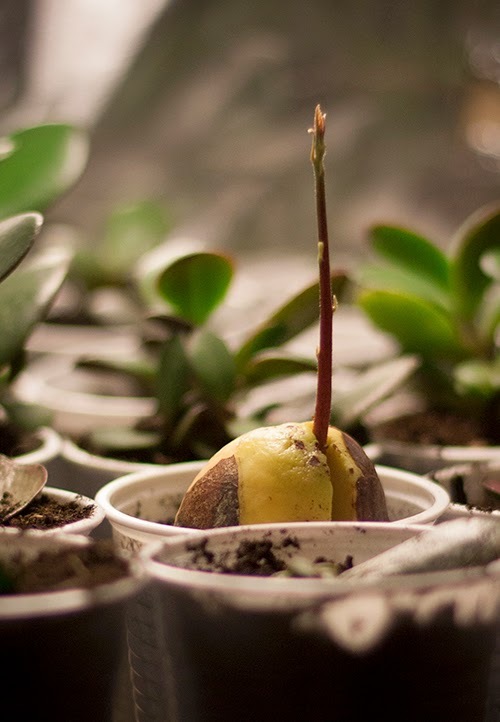 Just wondering about my 20-foot avocado tree, that I’ve grown from seed, whether it will survive to bear fruit this year. Here’s hoping. Today I pedaled 21.7 miles on my Schwinn 170. I crossed the 16,400-mile mark at 16,406.3 miles; 26,403.4 kilometers. And I’m still going, this journey still continues. In 5 more days I will have completed a year’s worth of pedaling and traveling virtually in Australia. This is my 360th day of Jim’s Trek Part III. Well the party has begun to gear up…and we will have to watch and listen to the wasted money of political commercials and braggadocios. Yes I’m using a correct word – Braggadocio: 1. overblown – empty boasting and swaggering self-aggrandizement; and 2. braggart – somebody who boasts in a swaggering self-aggrandizing way. No apologies. To date 10, that’s right TEN, Republicans have “Declared” their intent to run for President of the USA. Five have “Declined”… and 9 are “Exploring”. The list on The Politics and Governance Portal is sort of a long one of possible Republican contenders. On the Democratic side: 5 - “Declared”; 3 – “Declined”; and 2 – “Exploring”. The total list on the Democratic side is long, but not quite as long as the Republican list. 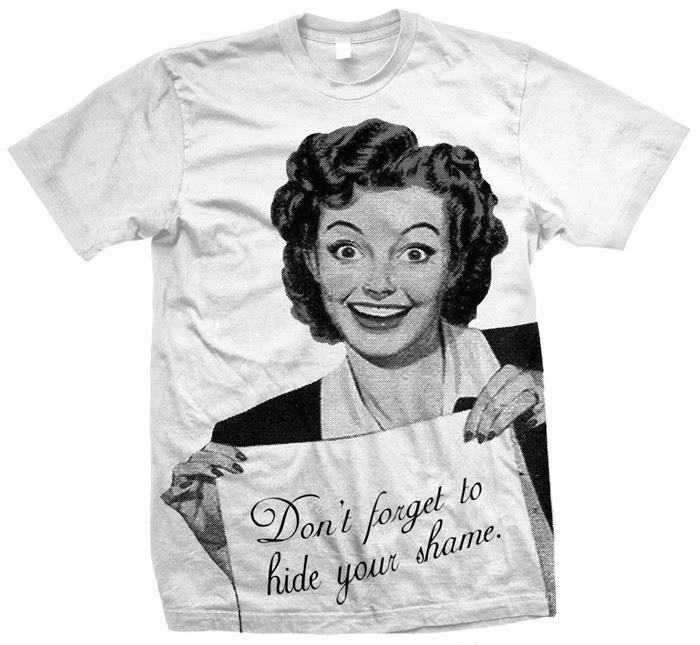 And then again I have found a great accessory to aid deafen the insane decibel clamor of squandered announcement and ad funds. 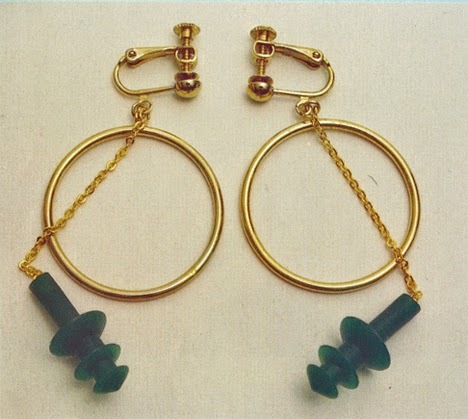 But wait – a pair of Chingogu Ear Plugs. And my search has begun. It appears that I’ve entered a phase; the “I’m-too-bored-to-cook” phase. 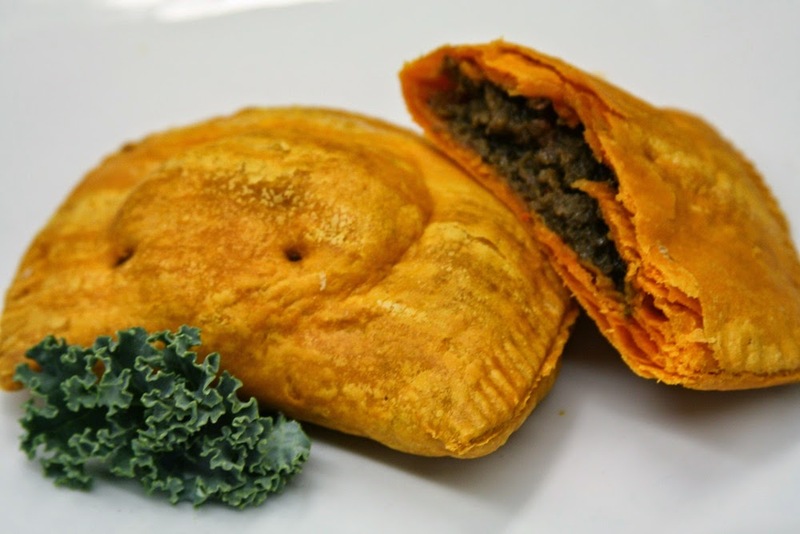 I know I love food and I know that I have got to eat, and so I am looking for simple but good recipes that supersede the funk and the complications. This is my 842nd post. According to Blogger Jim’s Trek has recorded, as of this morning, 64,675 Pageviews. This morning I pedaled another 21.8 miles on my Schwinn 170. I have now clocked 16,384.6 miles; 26,368.5 kilometers. This is the real part. I am traveling, (this is the virtual part), in a north-westerly direction on Barkly Highway. I have almost reached the intersection of Thorntonia Yelvetoft Road when I will be turning right, north. Well the craziness is about to begin. 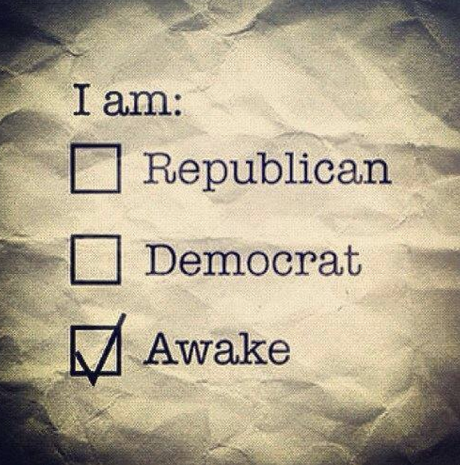 Either get out to vote or shut-the-hell-up. The 2016 Primary schedule should begin January 2016. All dates tentative and subject to change prior to 2016. Calendar. Tomorrow, according to USA Today, Reports:Ted Cruz to announce presidential run. Ted Cruz reportedly will announce on Monday that he will seek the presidency, with a campaign that seeks to energize the party's Tea Party and socially conservative wings. In fact, the consistent overgenerous assessment of Cruz’s brains may stem from a deeper problem with the values of the elite legal community. If Newt Gingrich is “a stupid person’s idea of what a smart person looks like,” Ted Cruz is a lawyer’s idea of what a smart person looks like. … A person with one or two core principles, and a ruthless willingness to bend any truth that gets in the way, can do very well for himself at law school. Certainly, this requires skill. But it would be a sad day for the progress of human knowledge if we called it intelligence. Quilting work continues on our new Chopsticks. The perspective is different both from the front and the back of the quilt. Today I draw the draft design for our new Moon Over Bayshore queen size quilt. Follow our updates at Quilts SB. Remember the new URL address – http://quiltssb.com. This is my 841st post. According to Blogger Jim’s Trek has recorded, as of this morning, 64,635 Pageviews. 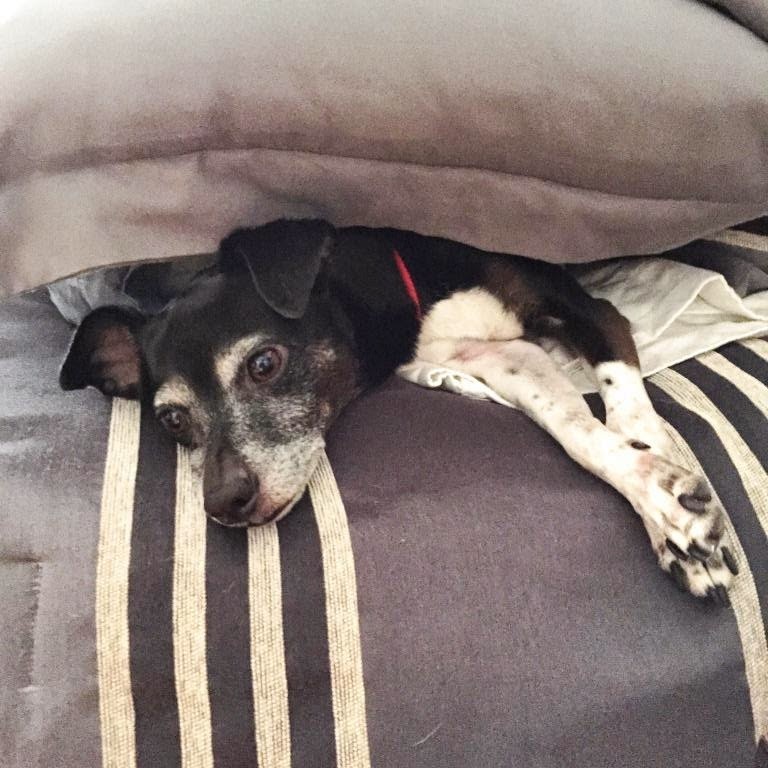 Bella decided that she was bored with my getting up this morning. This glorious morning I pedaled 21.9 miles on my Schwinn 170. Totals to date are 16,362.8 miles; 26,333.4 kilometers. I have completed 65.7% of my overall cycling goal. I am consistent on this crazy journey…but I can honestly say that I am getting bored... again. I am located on the National Highway A2. Nice thing is that Google Maps have updated their road images. Today’s snagged image was taken about 3 months ago in Queensland sometime in December of 2014. Yesterday’s road photo was grabbed from about 6 years about. As you can see not much has changed…expect maybe the clarity and/or definition of the newer image. Crossing my fingers as my blood sugar seems to be heading in a positive downward direction. This morning it registered at 95. 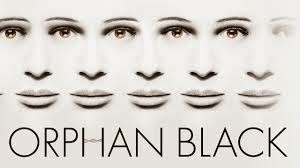 My viewing companion this morning while I pedaled was the beginning of Orphan Black. A very interesting, initially somewhat confusing, sci-fi drama about the idea of cloning. Initially I thought it was located in London, then in the United States, and then Canada. Confused? I still am…sort of, I think. 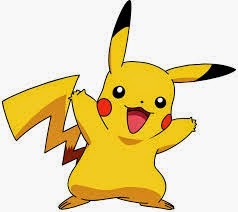 And speaking about cloning, see it just may have been the answer that I have been looking for regarding Pokemon. 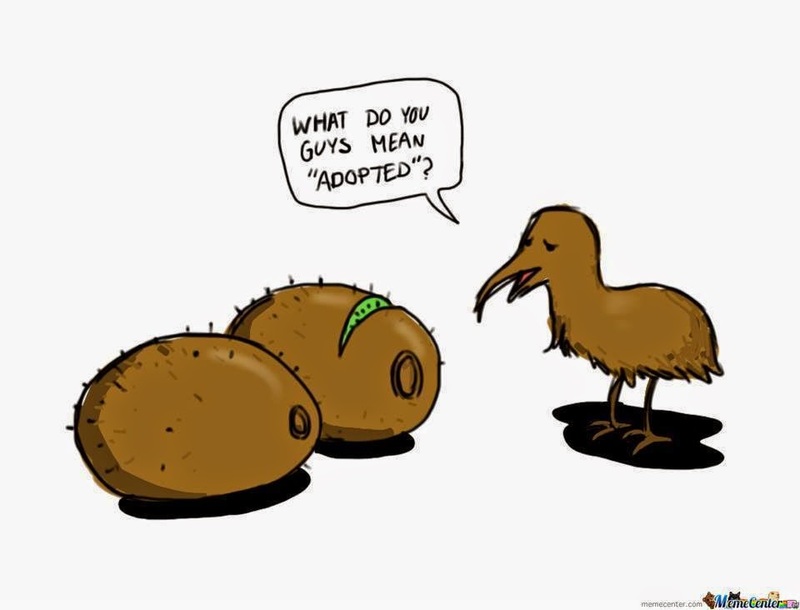 Always wondered where this cartoon may have originated. The left - the cartoon. 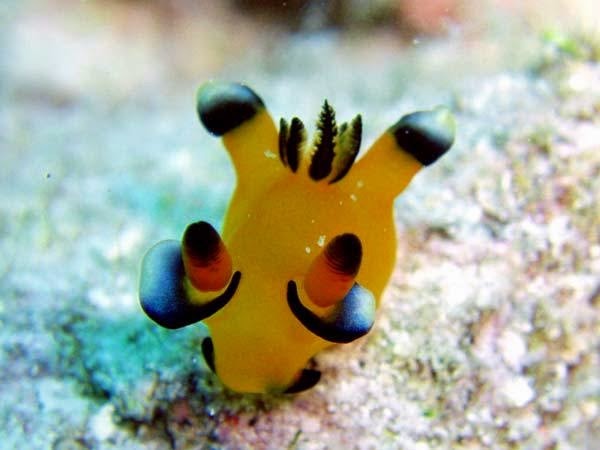 The right - Sea Slug - Thecacera pacifica. Political promises are never what they appear. – Michael Van Sickler, Miami Herald, March 20, 2015 . “Less than two months ago, an enthusiastic Gov. Rick Scott, fresh off his reelection victory, unveiled his plan to spend Florida’s $1 billion surplus. …Now that lawmakers might be facing a potential $1.3 billion hole in the healthcare budget, many of Scott’s once-attainable goals are in sudden limbo as money gets shifted around to cover gaps…"
This is my 840th post. According to Blogger Jim’s Trek has recorded, as of this morning, 64,539 Pageviews.